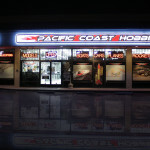 PCH and Team Losi LST 2 Wins! Home / News / PCH and Team Losi LST 2 Wins! Pacific Coast Hobbies wins the 2nd annual Endurance Race hosted at Thunder Alley Raceway sponsored by Proline Racing, Werks Racing, and Xtreme RC Cars Magazine. The winning drivers (from left to right) Kyle Stallings, Theo Captanis, Travis Amezcua, and Adam Drake would like to thank their sponsors Team Trinity, Team Losi, Team Orion, and Proline Racing for their support.